Installation instructions and wiring info. 22x19x3,equal to 5 row copper/brass, good for 480 HP. ...the wheels are ROH Snypers, which fit the 4 on 110mm 1st gen wheel pattern. It has come to our attention that the 3.636 gears from a '79-'82 RWD 626 will fit the '79-'85 RX-7 rear. The 3.308 ring & pinion from an '82-'84 Diesel powered B-2000 / Ford Courier will fit as well (Thanks Randy). For '79-'83 RX-7s, it is a direct replacement. '84-'85 RX-7s use a larger dia. 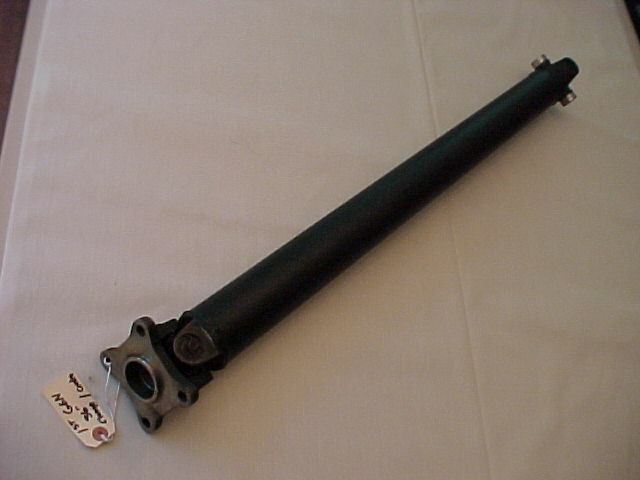 axle, but the side gears can be swapped, allowing use of the higher geared 3rd member in the '84-'85 RX-7s as well. ...What engines can I use? Most any small block Chevy V-8 engine will work (earlier engines made before '68 generally lack the accessory bosses on the ends of the cylinder heads, which are needed to mount the Mazda PS pump and AC compressor). The carbureted models make for an easier conversion, but TBI (throttle body injected) and TPI (tuned port injected) engines can be used. 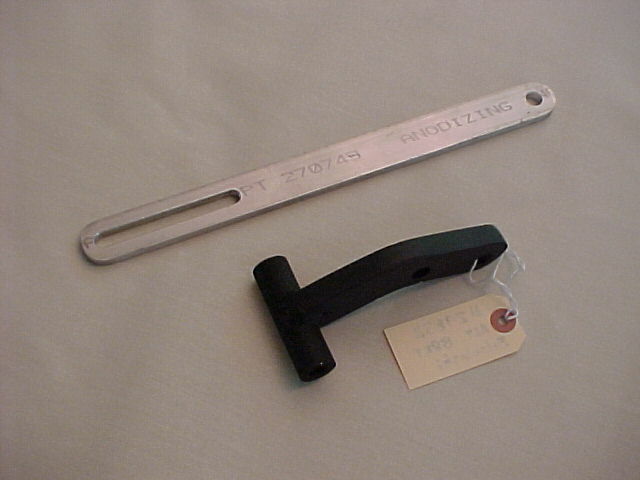 ZZ4s and LT-1s have also been used. ...Will the Chevy fit under my hood? Yes, with the proper attention to intake manifold and air cleaner selection. Stock height manifolds and 4bbl carbs require a drop base air cleaner. The lowest and most cost effective combination of aftermarket parts is the Weiand X-celerator manifold PN# 7547, combined with a TD Products (TransDapt)PN# 2147 14" air cleaner, which fits without any hood trimmimg at all. 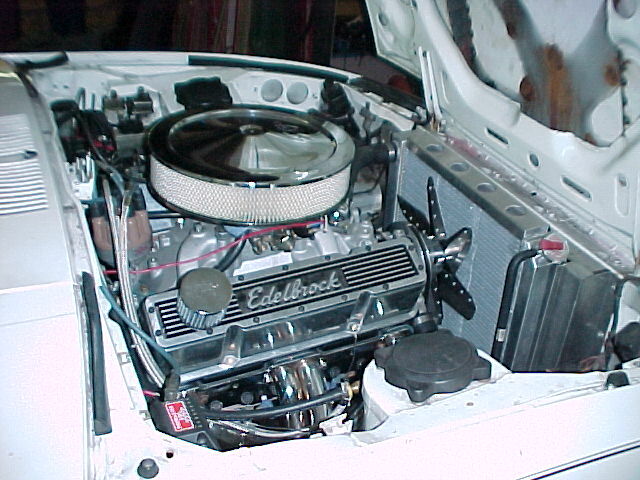 Higher manifolds such as the Edelbrock PERFORMER RPM require trimming out the inner hood brace in the area of the air cleaner. For TPI engines, the speed density units can be fitted with a throttle body mounted air cleaner, and are much easier to fit than the MAF equipped engines, which require a remote mounted air cleaner and extra ductwork. TPI engines also require removal of some of the underhood braces for throttle body clearance. ...How much weight will be added to my car? Surprisingly, not as much as you would think. The rotary engine, support equipment, and exhaust systems are heavier than they look. Typical weight gain for a 1st gen car is only 75-125 lbs. ...Can I use my stock RX-7 radiator? The stock radiator has been used, but it has to be relocated all the way forward to a vertical position for the V-8 conversions. In warmer climates, air-conditioned conversions may require using our HD aluminum radiator. If you use a stock radiator, use one from a '84-'85 RX-7, as they are much bigger. 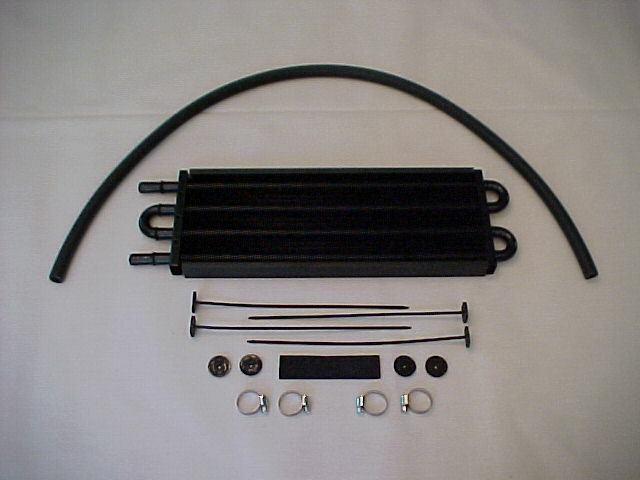 Plumbing the oil cooler from a '79-'83 or '86-up RX-7 to your V-8 will add tremendously to your cooling capacity, and it's addition will greatly improve your odds of success with a stock rad. 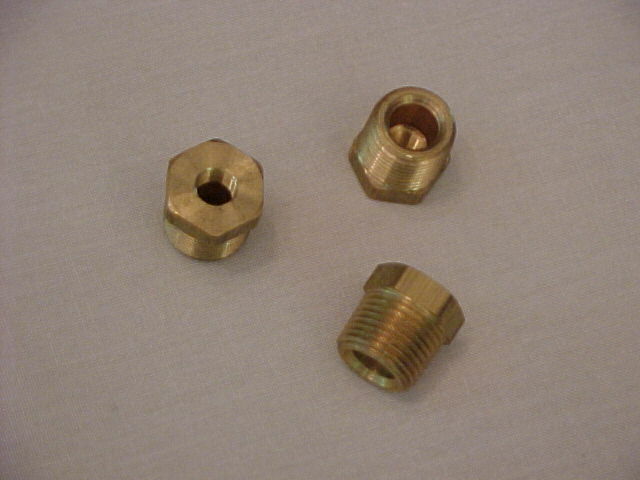 Oil cooler adapters that install between the Chevy's oil filter and it's base are available from many sources, including TransDapt and Fram, and custom hoses are easily fabricated. ...What about the 5 or 6 speed manual's shifter location? For a manual trans car, we recommend using the B/W T-5 5spd or the B/W T-56 6spd from a '82-up Camaro/Firebird. The shifter location for either of these transmissions work out great for the RX-7, and no modification to the RX-7's interior plastic is needed (The shifter ends up 1" rear of center in the '79-'80 cars, 1" front of center in the '81-'85 RX-7). ...Are there any special requirememts? The 1st gen. RX-7/Chevy V-8 conversion was designed around the small diameter '88-up distributor, which would likely be required for a smog legal conversion. 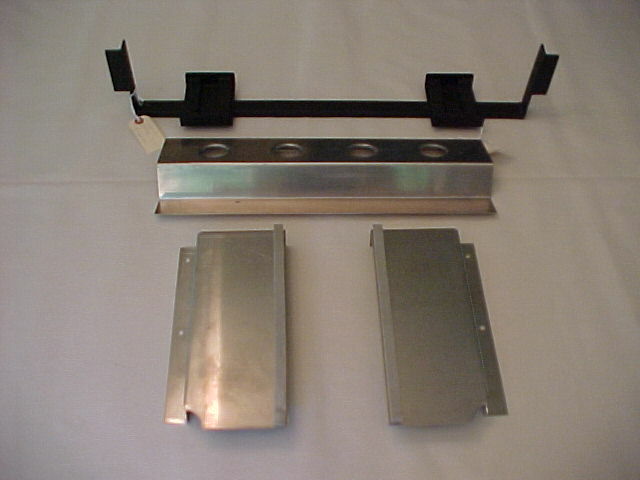 An older points style (pre-'75) distributor can be used, and will require no firewall reshaping. The larger dia. "HEI" units ('75-'87) require extensive massaging of the firewall. If an aftermarket electronic distributor is desired, the MSD Pro-Billet PN# 8570 is recommended for a trouble free installation, due to it's small size, and will give even more clearance at the hood latch. A "short" water pump (pre-'68 version) and drive pulley set is required. 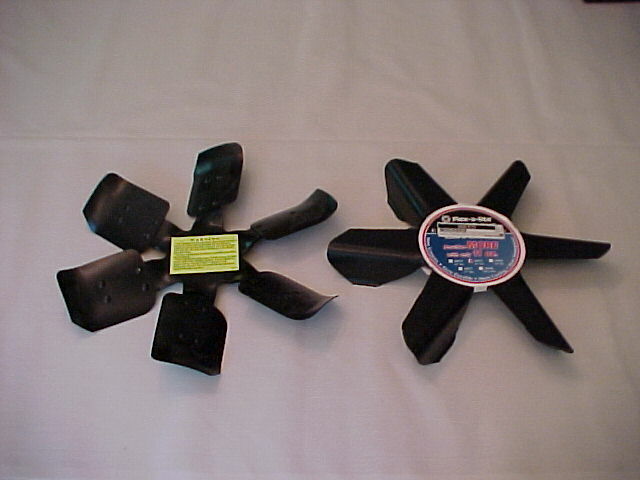 These water pumps and pulleys are now practically generic, and are available thru us as well as most auto parts stores. The pulleys can be found in both single and double groove configurations, but double groove crankshaft and water pump pulleys are required to drive either the Mazda P/S pump and/or A/C compressor. 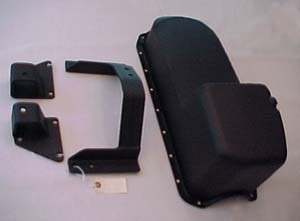 Most stock exhaust manifolds that exit down and to the rear will fit. There is also many header sets that have been tried. Here's a rundown. BLOCK HUGGERS...These are the ones that exit in the center of the engine near the bottom of the block, and are usually identical headers for both left and right sides. These WILL NOT fit without modification, as the #7 tube interferes with the steering box. Some customers have these modified to clear the steer box, but the block huggers exit points straight at the steering linkage, and will require some tight bends to clear. SHORTYS...These typically exit down and to the rear, in the same general area as the stock exhaust manifolds. This type of header generally fits, as long as the #7 tube clears the steering box. An exception is the style that exits almost straight back on the passenger side, which hits the passenger footwell. FULL LENGTH...As far as we know, our equal length headers are the only ones that will fit without compromising ground clearance. 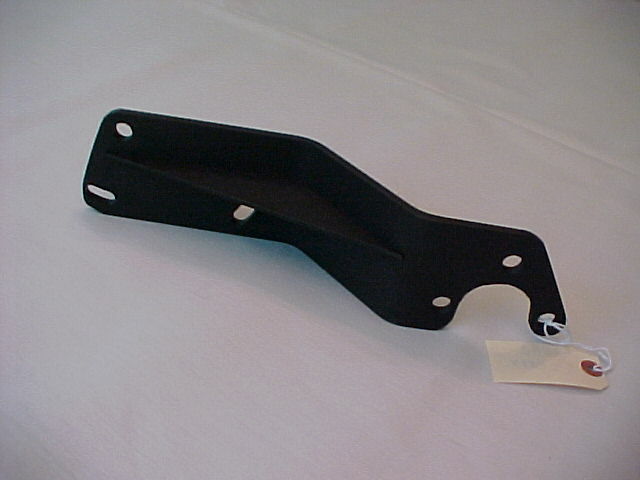 Some customers have reported that they used off-the-shelf headers designed for a '62-'63 ChevyII/Nova (which shares a similar steering box location), but their car had to sit higher than stock.We have no records of anyone ever finding any off-the-shelf full length headers that fit without ground clearance problems. TAILPIPES...Due to a lack of space under the 1st gen RX-7 for a true dual exhaust with separate mufflers, most choose to "Y" the exhaust into a single 3" or 3-1/2" pipe going to a like sized muffler located in the same place as the origional. If you want a true dual system with exits on both sides in the rear, the stock RX-7 gas tank will need to be modified to provide the room for the 2nd muffler. The early 1st gen cars that came with a thermo-reactor attached to the engine are generally not required to run a catalytic converter to be smog compliant, as the car lacks the proper shields, and adding a cat could introduce a fire safety hazard. ...How fast will my car be? Quickness of the car will be greatly improved, as the V-8 torque is about double that of the rotary engine. Overall top speed depends on the transmission selection and the RPM range of the engine. Expect a stock V-8 (with good tires) to produce 13-14 sec. 1/4 mi times. ...no cutting or welding required !! !